Designed by the same architect as the very popular Aloni Villas (Levante and Ponente) and under the same ownership. The recently completed Zephyros Villa is within walking distance of the delightful yachting harbour of Agia Efimia, with its shops, bakeries, bars, tavernas, post office, pharmacy, supermarkets and cash point. The villa which has been built to a very high standard and furnished luxuriously is set in gardens with a newly planted orchard, olive trees and colourful scented flowers and shrubs. There is a large heated swimming pool surrounded by sunbathing terraces, a poolside kitchen/barbecue, dining area and lounging area. The views from the different terraces are breathtaking either down the valley or over Agia Efimia to the sea and the Island of Ithaca. The location of Zephyros Villa is idea for exploring the beautiful Island of Kefalonia. From the numerous beaches, unspoilt mountain roads, the small villages with their picturesque squares to the busy town of Argostoli. Bedrooms 1,2 & 3 have en-suite bathrooms (Villeroy & Boch) with Grohe showers. Separate WC on ground floor Separate WC (Villeroy & Boch), separate wet room with Grohe shower in basement. Both can be accessed from pool area or internally. Reliable WiFi Bluetooth speaker for mobile phones, iPads, tablets etc. Fully fitted Alno kitchen.Granite work surfaces, hob, extractor, double cooker, fridge/freezer, dishwasher, microwave, wine cooler, toaster, coffee maker & Nespresso machine.Fully equipped inc.glasses, cooking utensils/pots, cutlery & Jasper Conran china. Bluetooth speaker for mobile phones, iPads, tablets etc. Notes on accommodation: Travel cot and highchair available. On your arrival you will be greeted by our English speaking local representative who will be available to assist you in any way and at any time during your stay. All 4 of the stylishly furnished bedrooms air-conditioned. As the villa is fully central heated and has a wood burning fire it would be idea for out of season holidays. The covered gazebos are ideal to enjoy the views on the milder days of winter. 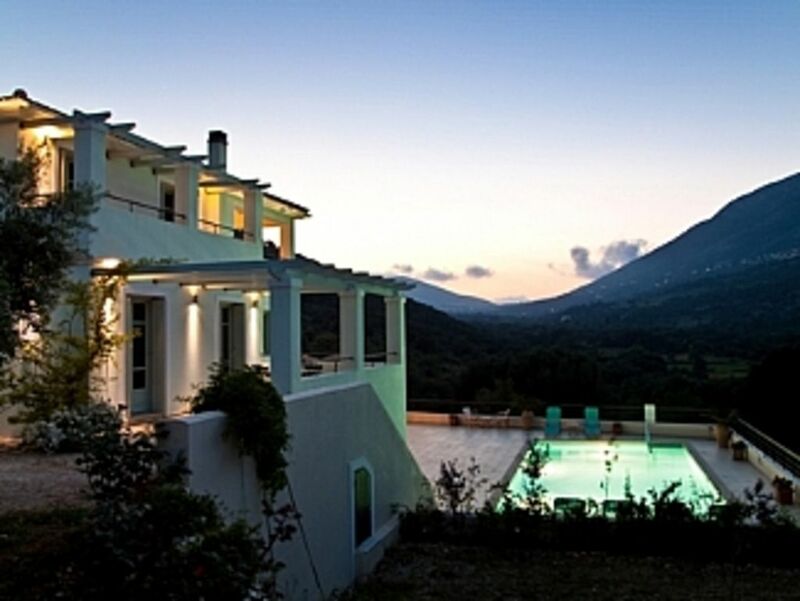 Zephyros Villa is perfect for a family Christmas or Easter break. Early spring is particularly nice as there is a perfusion of wild flowers by the road side and in the fields. The pool is filled at the end of March and emptied at the beginning of November and is heated between 30.04.17 to 01.10.17. All bedrooms are non-smoking. The villa has free wireless internet connection. Outside: Children should be supervised at all times. Drive through the remote controlled main gates to a large parking area. Set in private garden, secluded seating areas in both sun & shade inviting you to relax & gaze at the enchanting views or just enjoy the profusion of colours and scents of the beautiful flowers. The newly planted orchard includes numerous varieties of fruit and nut trees, whilst many old gnarled olive trees add charm. Within the spacious outside area there is a sparkling pool (11x 5.5m) with a constant depth of 1.4m heated by an oil boiler to a max 82F/28C surrounded by a large sunbathing terrace. 5 tiled connect gazebos provide shade for the well equipped pool side kitchen with 2 fridges and dishwasher, mobile gas BBQ, dining area with table seating 10 and a lounging area, plus there is an outside tennis table. Stunning views of the valley can be enjoyed from all terraces, also from all bedroom terraces the view is spectacular across Agia Efimia, the sea and onto Ithaca. Utility Room: Clients own utility room containing a sink and cupboards. It has a washer/dryer, ironing board, iron, and clothes airer and clothes pegs Cleaning / Towels / Linen / Maid service: There is a maid service three times a week with linen, towels changed twice a week. We provide pool towels and are also happy to provide beach towels. Other: Ground Floor: TV room with 35’ plasma TV, Satellite (Nova), DVD player, sofa bed. Basement: Changing room can be accessed from pool area and internally. Games / garden room with French doors to pool area. Just spent a week in this beautiful home. You can smell the clean as you walk through the front door and then your met and welcomed by gorgeous George. There is nothing I can fault other than I wish we could have stayed longer. It's beautiful, the village is lovely. The taxi drivers that picked us up looked after us all week, especially so when the baby was poorly and had to go to Sami. Great paediatrician even more reason to visit. Thank you so much for a great first villa experience. We will be back. We first found this villa 7 years ago and love it so much we have returned every year since. It is a fantastic place to stay and no expense has been spared in making this a luxurious "home" to stay in whatever age group you are. It has something for everyone, a room dedicated to younger children, filled with lots of toys and games. Table tennis, a beautiful pool, tv room and fantastic views up the valley. The village and restaurants are within walking distance and the outside kitchen and BBQ area are brilliant for those who want to dine in. Tracy and Mario, who own the villa together with Maureen, George and Keriaka, are on hand to help with anything you need or any problem you may have. You are made to feel like part of their family yet they never intrude on your holiday unless invited. It is the little touches that make you feel special, like hot water and breakfast left out on the terrace when there was a sudden power cut and a fridge full of goodies on arrival. This isn't your usual holiday rental. This is a very special villa with lovely, thoughtful, helpful people who want you to enjoy your holiday and love their villa as much as they do. What can I say!!!!! We have had the most fantastic week in Zephyros Villa. We could not have wished for anything more. The standard of features both inside and out surpassed all of our expectations. The outside kitchen was so well thought out and equipped who would want to be inside when each morning we woke to brilliant blue skies and 30 degree temperatures. Situated in a quiet lane 15minutes stroll from the village centre makes it a perfect location. I challenge any visitors to find a more suburb place to stay.Well done Tracy and Mario you did us proud! The building is superbly designed and of excellent construction with spacious, well appointed en suite bedrooms and lounge with an extremely large lounge and two superb kitchens. Yes two. The second being outdoors by the pool but within an extensive covered dining (& games/BBQ) area and fully equipped with all utensils and high quality unbreakable crockery and glassware so no problems carrying hot food about or risking breakages. All ovens, refrigerators, wine cooler etc are best quality and the pool is heated with a vast area of tiled patio so bare feet OK and lots of sun loungers. There is a well equipped playroom as well as TV/cinema room if kids get bored and wifi / landline telephones, for all to keep connected. Bed linen is Harrods of Knightsbridge quality if not actually bought there and all towels are supplied for bathroom, poolside and beach with a purpose built laundry suite on the premises for the maid who kept everywhere sparkling. Mario, Tracey & Maureen are charming and caringly attentive so one feels instantly welcome without the least sense of intrusion. We visited as a three generation family group and without exception found everything highly satisfactory. Our only regret? That our holiday came to an end! 3rd visit to Zephyros villa since 2009 and each time is like the 1st. This villa is possibly the best villa you will ever rent, everything for your comfort has been catered for and Mario & Tracy the owners will make you feel right at home. We stayed here for two weeks this summer and had an absolutely super holiday. It was one of the most well equiped villas we have stayed in. The quality of the fixtures and fittings were second to none and the thoughtfull added extras like the L'occitaine toiletries in the bathrooms made all of the difference. The location of the villa was also superb, it was great to be able to walk to the village in the evening. We have had no hesitation in recommending this villa to friends and have already booked to return ourselves. The service Tracy and Mario provided also enhanced our stay, nothing was too much trouble for them. A 15 minute drive west through the valley takes you to Myrtos Beach famed for the beauty of white sand and blue water. Anti Samos beach with the breathtaking sweep of the bay and sparkling clear water, ideal for snorkelling, is a 25 minute drive along the beautiful east coast with the view of Ithaca always in sight. Within and just outside Agia Efimia there are many small beaches and coves, some can only be reached by hiring a motor boat and so will give you the seclusion you may wish for. The Argostoli Airport (EFL) is a 60 minutes drive away. Should you wish to explore the island a hire car is recommended. Taxi are readily available. A local bus service runs to Myrtos Beach and in the villages in the valley (further info. available at the tourist office in Agia Efimia).The pretty port of Sami is a 15 minute drive from which you can catch a ferry to the beautiful island of Ithaca or to Patras on the main land of Greece. The capital of Kefalonia, Argostoli, with its wealth of shops, restaurants and bars, plus the Archaeological Museum and Corgialeneion Historical and Folk Art Museums is 30 Km. A 15 minute drive away is the Port of Sami which has a medical centre. The fascinating Drogorati Caves are 11 km away and the Mellisani Underground Lake, just outside Karavomilos is 6 km. To the south of the island Poros is 30 km and Skala 40 km. To the north spectacular Assos is 10 km and picturesque Fiskardo is 30km. Agia Efimia has many colourful tavernas, cafes and bars, and ice cream parlour. There are also souvenir shops, supermarkets, bakeries, a butcher, a post office, pharmacy and cash point. You can also hire motor boats to explore the spectacular local coves and small isolated beaches, and cars or mopeds to discover the beauty of Kefalonia. If you are feeling energetic there are a number of local walking trails, or you can book a tennis court plus there is a scuba diving school.